The holidays can be overwhelming for children and their parents. Between all of the sugary treats, abundance of presents, and focus on the commercial aspect, the true meaning of the season can be lost. At Shine, we make sure to remind our students and their families that a little effort and some simple crafts can go a long way. Here are some of our favorite holiday crafts and tips. They are all sure to emphasize important skills and lessons as well as provide some good old-fashioned family bonding while serving as a reminder about the importance of doing for others. Bake together. Everyone loves a homemade treat, especially at the holidays. And cooking introduces important skills for a young child: mixing, measuring, math and even color concepts by adding food coloring to white frosting. There’s chemistry in the kitchen, and cooking always provides yummy, instant gratification while satisfying so many areas of development. But the family bonding is best! Make homemade ornaments. We love to paint pinecones, add sparkly glitter and hang them from a tree. But there are countless ways to create homemade ornaments. Styrofoam balls from the craft store rolled in glue then glitter. Clothespin reindeer. And many stores and websites sell small, round wooden picture frames that can be decorated and hung for a keepsake that will be sure to adorn the tree for years. Decorate a piggy bank and use it to collect charity. At Shine, we spend a lot of time doing charitable projects. Teaching young children the importance of giving back can be daunting. 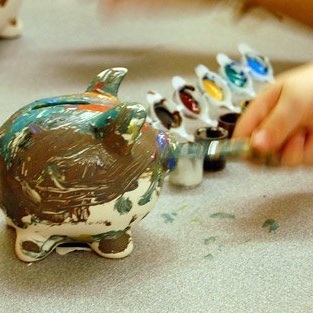 We love the idea of ordering plain piggy banks and having children decorate them with acrylic paints and rhinestones. We use these special banks to collect money for charity. When the bank is full, take the money out, count it together, and donate it to a charity of your choice. The holidays can be a special time for families to spend quality time together creating gifts and memories that have little to do with spending or receiving and everything to do with giving. And glitter! Happy holidays from Shine!